Let’s face it: When the weather gets rough, people try avoid it. This winter is poised to be a rough one, which means you can count on spending lots of time holed up your cozy, centrally-heated home. Problem is, all that time indoors can can spell more than than just cabin fever—it’s not so great for your physical health, either. “The whole lifestyle in the winter months is a much more hermetic lifestyle,” said Mani Kavuru, director of the division of pulmonary and critical care at Jefferson University Hospital. And staying indoors with the doors and windows shut tightly means the air you breathe becomes stale and contained—ick. As it is, urban living isn’t exactly lauded for its great ventilation. 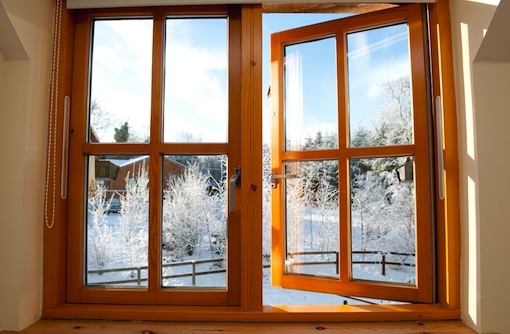 Since people generally keep their windows closed in the winter, anything that gets inside can linger in the air unless it is somehow removed. Kavuru says that cigarette smoke is one of the biggest offenders. If you or someone in your household is a smoker, you face the risk of increased exposure to second- and third-hand smoke (the remnants of tobacco and chemicals that remain embedded in surfaces after second-hand smoke has cleared). This exposure puts one at risk for lung cancer, so smokers should limit smoking to outdoor areas. Other in-air pests: dust, mold and cockroach dander (ew), all of which are in most homes, can send people into sneezing fits. These are worse in poorly ventilated spaces and put the one-third of folks who experience mild allergy symptoms at a greater risk of developing asthma. Preexisting conditions like bronchitis, emphysema and asthma can be irritated by these triggers as well. We’re also well into cold and flu season, and chances are you’re picking up cold and flu viruses throughout the day and depositing them on surfaces in your home without even knowing it. With these viruses remaining in homes, occupants become more susceptible to catching something the more time they spend inside, especially if there are multiple people living in the house. Oh but wait, there’s more bad news: Spending too much time indoors can cut off your body’s supply of healthy gut bacteria, which can throw you off in a number of ways. Not to mention that avoiding the weather by eating snacks in front of the TV—we’ve all been there—can pack on the pounds. The good news is, there’s a super simple solution to all these indoor-winter woes. Ready for it? Get outside. Just because it’s not T-shirt weather out there doesn’t mean you should forget about the great outdoors until the ground thaws. There are plenty of things that you can do outside during the winter. Philadelphia has one of the largest urban park systems in the world, and you can still take advantage of those green spaces in the winter—just throw on a few extra layers of clothing. Popular for its creek and miles of tree-shaded trails, Wissahickon Valley Park is open year-round and it’s particularly lovely after a snowfall. Or you can grab some blankets and thermoses of hot soup and head to any neighborhood park in the city, and have a winter picnic! One great thing about winter is that it’s the perfect time of year to go ice skating. The Blue Cross River Rink at Market Street and Columbus Boulevard is a popular outdoor rink. You can also check out the ones with free public skate sessions. And don’t let the lower temperatures keep your bike not he sidelines. When the roads are safe, head to the Schulykill River trail for a winter ride. If you don’t have your own two-wheeler, Wheel Fun Rentals keeps their bike and surrey rental services open during weekends and holidays in the winter so you can bring the entire fam. While winter may make the outdoors seem a little intimidating, remember that there are still plenty of ways to enjoy yourself outside to avoid spending too much time indoors. And even if you do happen to find yourself having some couch-potato moments this winter, remember to do the best you can to limit the amount of allergens and irritants in the air.